The McSweeney’s archive, which the Ransom Center acquired in 2013, is now open for research. Founded in 1998 by Dave Eggers, McSweeney’s Quarterly Concern is considered one of the most influential literary journals and publishing houses of its time. McSweeney’s publishes books, Timothy McSweeney’s Quarterly Concern, The Believer magazine, the food journal Lucky Peach and the DVD-journal Wholphin. This is the third in a four-part series highlighting items from this dynamic and diverse collection. In 2002, Heidi Julavits, Vendela Vida, and Ed Park began planning a long-format magazine featuring essays, interviews, and reviews. With the assistance of Dave Eggers and the McSweeney’s staff, The Believer was launched in 2003. The same year, Andrew Leland, former intern at McSweeney’s, was offered the job of managing editor to create the second issue of The Believer magazine. Leland dropped out of Oberlin College to take the job, and he continued in the post for eight years and 75 issues. The Believer, easily identified by its iconic cover template designed by Eggers and illustrated with drawings by Charles Burns, has become a monthly art and culture magazine featuring content unimpeded by arbitrary word limits and highlighting schematic drawings, illustrations by Tony Millionaire, and regular columns by Nick Hornby, Greil Marcus, and Jack Pendarvis. The Believer is also home to the “Sedaratives” advice column founded by Amy Sedaris and featuring guest contributors from Janeane Garafolo to Weird Al Yankovich. The magazine also puts out three special issues a year dedicated to art, film, and music. Numbers one through four are all crossed out, giving a brief glimpse into the creative, interesting, and mundane aspects of being a Believer editor. The Believer attracts remarkable writers and remarkable readers. 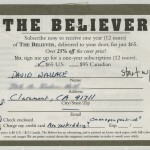 David Foster Wallace’s subscription postcard for The Believer is evidence that they’re sometimes both. It’s humorous and prized—the tape still adhered to the card with flecks of wall paint suggests it was hanging on Leland’s wall. Please click on thumbnails below to view larger images. 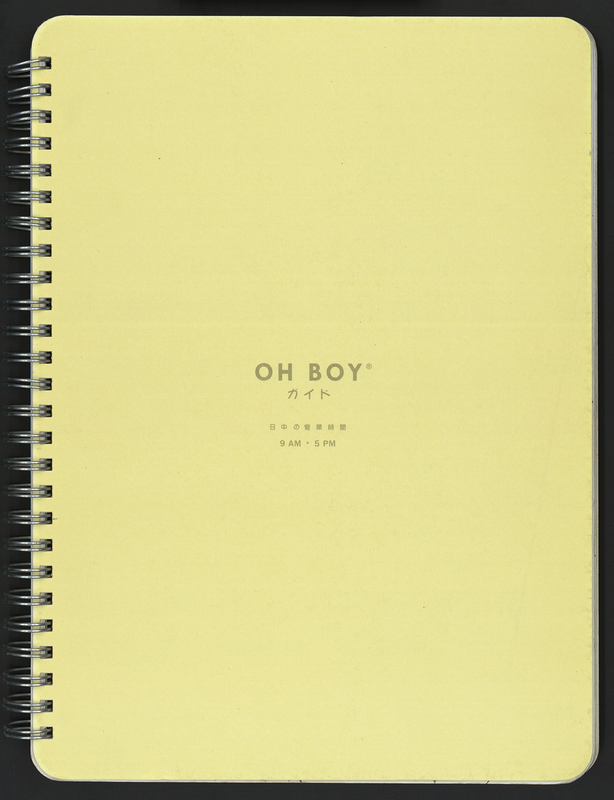 Cover of notebook kept by Believer magazine editor Andrew Leland. 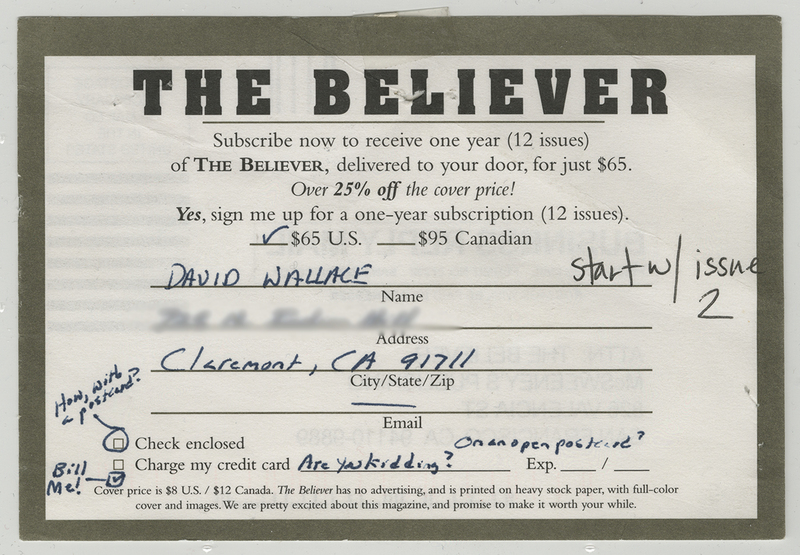 Believer magazine subscription card filled out by David Foster Wallace.